Очень разные и калиброванные фланцами измерители потока позволяют в очень большом диапазоне измерять как жидкости с различной плотностью, так и газы. Различные измерители потока – это отлично калиброванные из боросиликатного стекла измерители, корпус которых изготовлен из нержавеющей стали или пластика. Измеритель может быть также полностью изготовлен из плексигласа. В наличие версии, как с резьбой, так и с фланцами. Дополнительные данные: min. и max. сигнальные датчики потока и стандартизированный выходной сигнал 4 - 20 мA, который пропорционален массе потока. The visual flow indicators are apparatuses which are used for visual fluids is flowing or not within pipelines. We produce flow indicators for both horizonatl and vertical mounting suitable for the most diverse industrial applications. Flow switches are apparatuses which are used for visual or ON/OFF - type alarm signalling whether a fluid or a gas is flowing or not within pipelines. We produce flow switches in various models, with valve body, bladed and flow indication, thermal dispersion type, suitable for the most diverse industrial applications. CV SeriesBody valve flow switch for water, for max. or min. flow alarms, with a single switching unit, with output on SPDT switch. Catalog Sheet PLD SeriesPaddle type flow switch for water, with max. or min. flow alarm, with a single switching unit and with output on SPDT switch. Catalog Sheet PL SeriesPaddle type flow switch for water, with max. or min. flow alarm, with a single switching unit, and with output on SPDT switch. Full range of variable area and with calibrated flange flowmeters allowing for a vast application for small and higth liquid and gas flows. The variable area flowmeters have a perfectly calibrated borosilicate glass gauge with a stainless steel or plastic material body, or are totally manufactured in plexiglass. They are available in threaded or flanged version. Accessories: minimum and maximum flow alarms and 4 - 20 mA standardised signal at output, proportional to the flow. 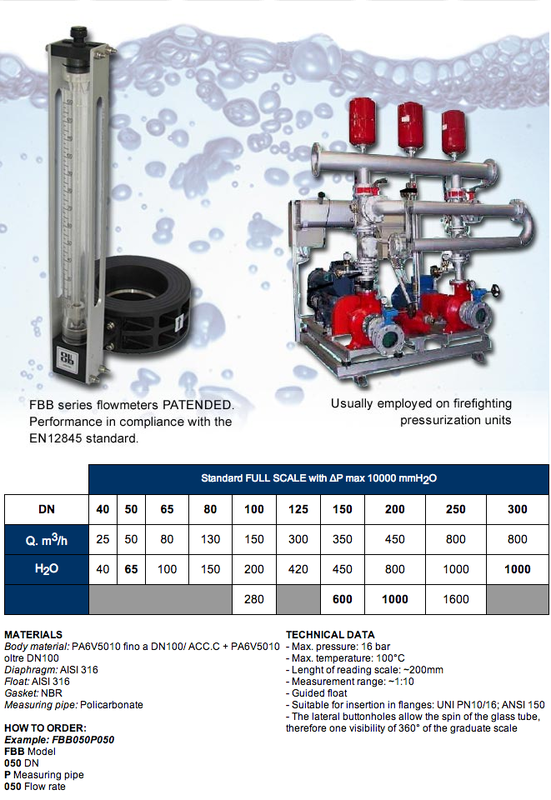 FD SeriesVariable area flowmeters with glass measuring tube for small and large flows, suitable for gases and liquids. 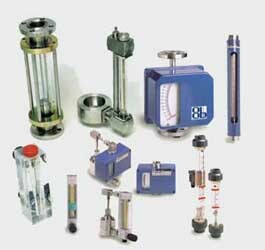 Catalog Sheet 500 SeriesVariable area flowmeters with glass measuring tube for small and large flows, suitable for gases and liquids. Catalog Sheet FTV SeriesVariable area flowmeter with borosilicate glass tube, for high and low ranges of liquids and gases. Catalog Sheet RV SeriesCalibrated flange-type orifice plate flowmeters with offtake flowmeter for large and very large flows. Catalog Sheet 110 - 130 - 132 - 140 SeriesVariable area flowmeters with plexiglas body for small and medium size flows, with max.operating temperature of 60˚C.